Have you been trying to start a blog, but don’t have a clue of where to start? Or have you blogged before, but have lost that blogging feeling? These following 8 tips from the Sugar Pine Realty Blog may give you some inspiration and ideas on how to get going, either for the first time, or for the first time in a long time! 1. 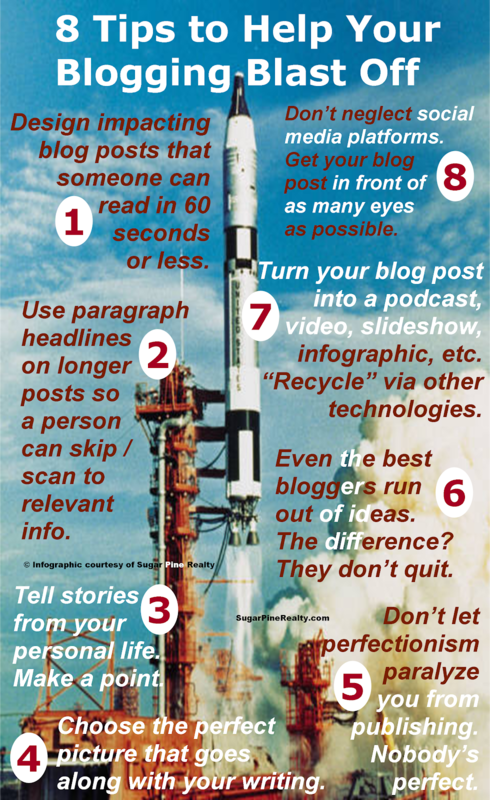 Design impacting blog posts that someone can read in 60 seconds or less. 2. Use paragraph headlines on longer posts so a person can skip / scan to relevant info. 3. Tell stories from your personal life. Make a point. 4. Choose the perfect picture that goes along with your writing. 5. Don’t let perfectionism paralyze you from publishing. Nobody’s perfect. 6. Even the best bloggers run out of ideas. The difference? They don’t quit. 7. Turn your blog post into a podcast, video, slideshow, infographic, etc. “Recycle” via other technologies. 8. Don’t neglect social media platforms. Get your blog post in front of as many eyes as possible.